Is winter getting to you yet? Usually, about this time in the month of February, I've had enough of winter. It's happening on cue again this year. When I've had enough of winter's bleakness I turn to baking sweet treats like these Cranberry Chocolate Chip Oatmeal Cookies. I wanted to make a cookie that would mix sweet and tart flavors together. These cookies do that perfectly. 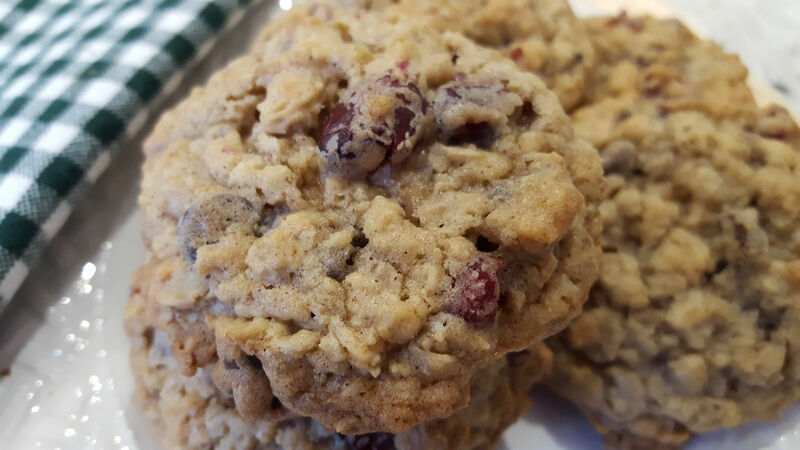 Don't you love the texture of a soft and chewy oatmeal cookie? 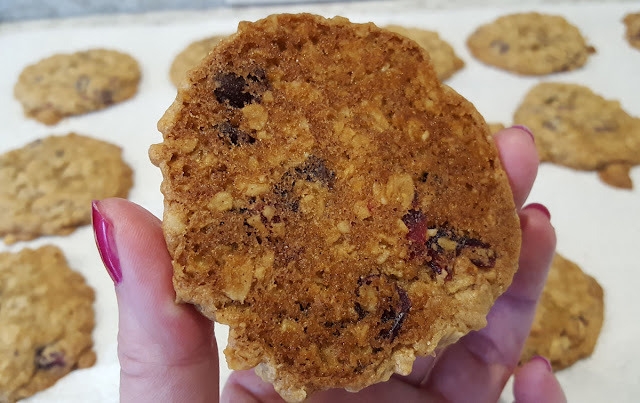 I'm not a fan of raisins so I prefer substituting dried cranberries for the raisins you might find in a traditional oatmeal cookie. 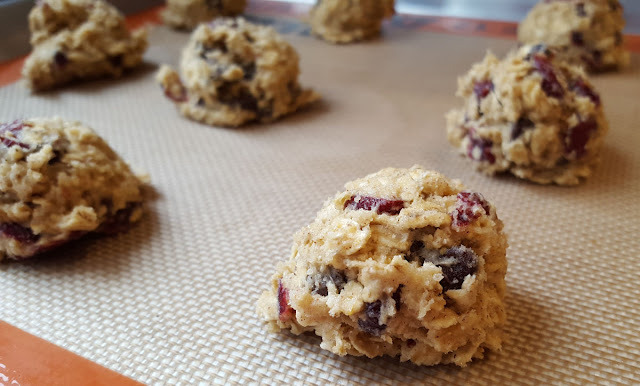 Adding semi-sweet chocolate chips seemed like a good choice to pair with the tartness of the dried cranberries in these cookies. I hope you like it, too. Somehow I'm able to delude myself into thinking these might be healthy cookies. 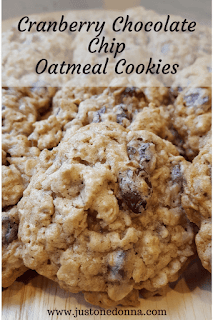 After all, there are three cups of old fashioned oats in this recipe. And, don't forget the dried cranberries. They're good for you, right? 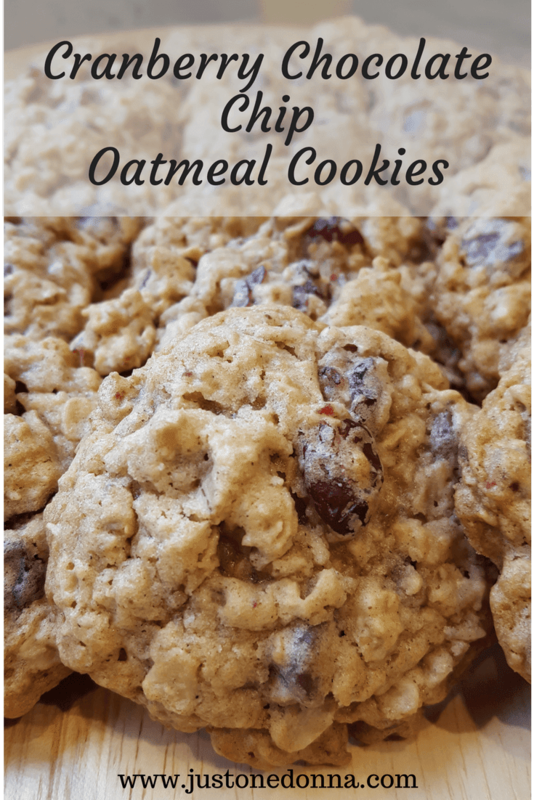 I'm kidding, of course, but healthy or not, these cranberry chocolate chip oatmeal cookies are good for what ails you on a dreary winter day. You'll also like that these are no fuss cookies. Just mix the ingredients together and bake. The whole assembling of the recipe takes five minutes tops. In less than thirty minutes you can have warm cookies to share with friends and family. Preheat your oven to 350 degrees F. Mix together the flour, salt and baking soda in a medium bowl. Set aside. In the bowl of your stand mixer, beat the butter and sugars together until light and creamy. Beat in the eggs and vanilla. Add the flour mixture and stir until combined. 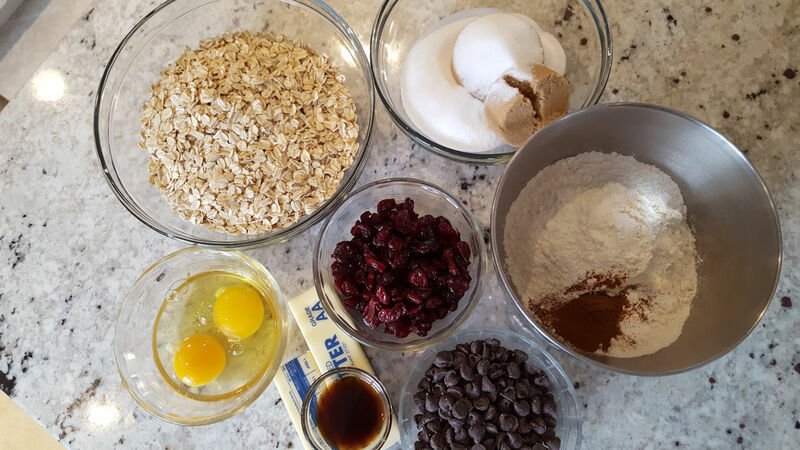 Stir in the oats, cranberries and chocolate chips. Using a scoop for standard sized cookies, scoop the batter onto an ungreased cookie sheet. Bake until set and lightly browned, from 8-12 minutes, depending on the size of your cookies. Thanks for sharing this post on Facebook, Pinterest, Twitter, and Yummly!